Engaging with stakeholders, facilitating community involvement, and collaborating with partners. Groundwater agencies formed by June 30, 2017. Groundwater sustainability plans adopted by January 31, 2020 for critically overdrafted basins. SGMA places the responsibility of sustainable groundwater management on groundwater sustainability agencies (“GSAs”), which can be any local agency that has water supply, water management, or land use responsibilities within a groundwater basin, or a combination of such agencies overlying a basin. SGMA provides 15 state-chartered local groundwater management agencies, including PVWMA, with the exclusive right to be the GSA in their respective statutory boundaries, unless they opt out. All GSAs must be formed by June 30, 2017. The Board of Directors of the Pajaro Valley Water Management Agency voted in favor of becoming a GSA in August 2015. The Notice of Election Package was submitted in September and is available on DWR’s list of GSAs. 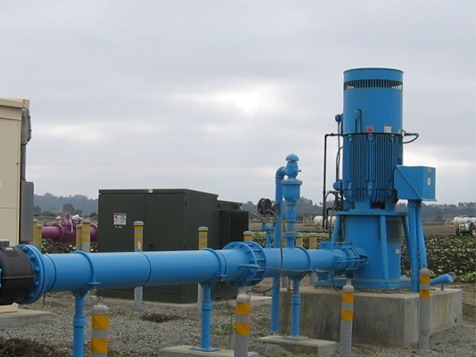 SGMA establishes a process for local agencies to request that DWR revise the boundaries of a groundwater basin, including the establishment of a new subbasin. California’s groundwater basins and sub-basins are defined in the DWR’s Bulletin 118-Update 2003. DWR has released emergency regulations outlining the process that local agencies must follow when requesting modifications to existing boundaries of groundwater basins and sub-basins. The regulations identify the methodology and criteria that will be applied by DWR when reviewing and approving the modification requests, which may be scientific in nature, jurisdictional, or a combination. The period when basin boundary modification will be accepted by DWR for review is from January 1, 2016 through March 31, 2016. A second window for basin boundary modifications may open in 2018. More information on basin boundary modifications, including links to the adopted emergency regulations is available on DWR’s Basin Boundary Regulations webpage at http://water.ca.gov/groundwater/sgm/basin_boundaries.cfm. 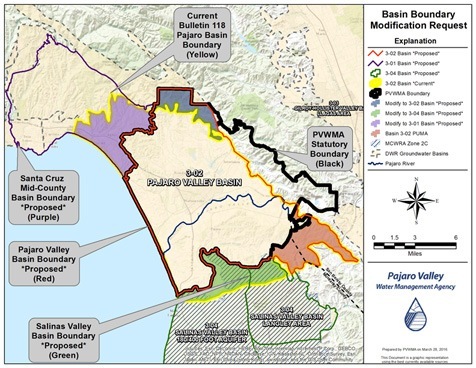 The Pajaro Valley Water Management Agency is currently exploring a basin boundary modification proposal that adjust a small portion of the Purisima Formation Basin to Pajaro Valley Basin, and adjust a portion of the Pajaro Valley Basin to the Salinas Valley Basin. The proposed basin boundary modifications are shown on the map below. As illustrated on the attached map, the statutory boundary of the Pajaro Valley Water Management Agency (PVWMA) includes a majority of the Pajaro Valley Groundwater Basin (Basin 3-02 per B118), and a portion of the Purisima Formation Basin (Basin 3-21 per B118). However, portions of the Pajaro Valley Basin extend beyond the PVWMA statutory boundary to northwest in the Soquel/Aptos area, to the south in Monterey County, and to the east in San Benito County. A majority of the Purisima Formation Basin is located to the north and west, outside of the PVWMA statutory boundary. To address the many complex issues associated with the development and implementation of GSPs, DWR developed a series of 10 topic papers intended to facilitate meaningful and focused discussion with advisory groups, stakeholders, partners, and the public to better understand the issues. The discussion papers focused on: (1) Measurable Objectives and Interim Milestones; (2) Pre-SGMA Conditions and Undesirable Results; (3) Land Use and County Involvement; (4) Alternative GSP Submittals; (5) Boundaries and Overlapping Areas; (6) Intra-Basin Coordination Agreements; (7) Water Budgets and Coordination; (8) State Agency Coordination; (9) Data Collection, Management, and Reporting; and (10) Adaptive Management and Focus Areas. On February 18, 2016, DWR released for public review the Draft GSP Emergency Regulations for public review and comment. The comment period ends on April 1, 2016. DWR will present the GSP Emergency Regulations to California Water Commission for consideration and potential adoption in the Spring 2016. Upon approval DWR will submit the adopted GSP Emergency Regulations to Office of Administrative Law. More information is available on DWR’s Groundwater Sustainability Plan Draft Emergency Regulations webpage at http://water.ca.gov/groundwater/sgm/gsp.cfm.